Solitary neurofibromas (SNFs) are rare benign peripheral nerve sheath tumors. Unlike neurofibromatosis, SNFs occurs as single entities. They are uncommon in the oral cavity, and it is even rarer in the floor of the mouth. When encountered in the oral cavity the differential diagnoses should consist of both benign and malignant tumors. A rare case of solitary benign neurofibroma occurring as an exophytic lesion in the floor of the mouth is being reported. Tumors of neural origin are rare in the oral cavity. The peripheral nerve sheath tumors comprise both benign and malignant tumors such as neurofibroma (NF), traumatic neuroma, neurilemmoma, pallisading encapsulated neuroma, and malignant peripheral nerve sheath tumor. NF is an unencapsulated benign, well-circumscribed tumors with schwann cells, endoneurial fibroblasts, and perineurial cells., NFs can be solitary or multiple. 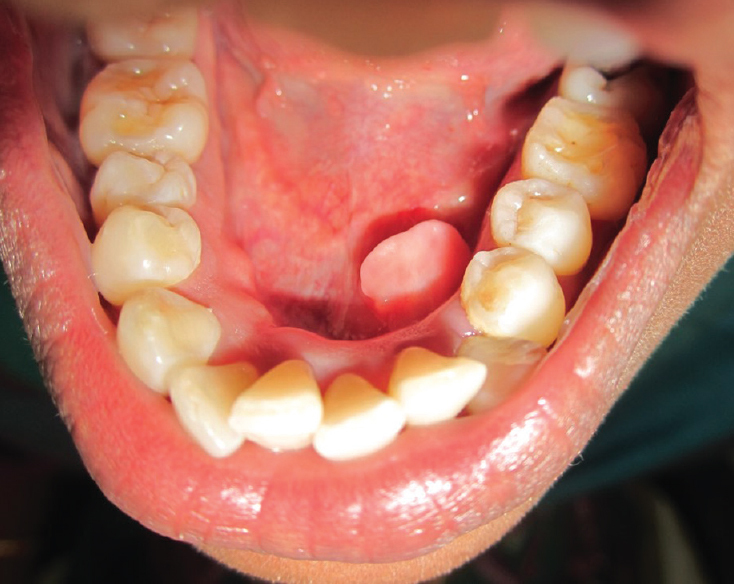 Although NFs elsewhere in the body are considered quite common, they are rare in the oral cavity, especially the solitary NF (SNF) which is totally unrelated to neurofibromatosis., The first case of oral SNF was reported in the year 1954. A 45-year-old female patient visited the Dental Hospital with a chief complaint of a growth in the floor of the mouth for 2 months. The patient stated that the growth had started insidiously 2 months back which was initially small and had grown gradually to reach the size at the time of presentation. There was no history of trauma preceding the onset, no pain, paresthesia, or any discharge. There was no difficulty in opening the mouth or similar swellings or growths elsewhere in the body. Her medical, surgical, and dental histories were noncontributory. The regional lymph nodes were not enlarged. On examination, a solitary, well defined, sessile, and exophytic leaf-shaped growth was noted on the left side of the floor of the mouth measuring 1.5 cm × 2 cm in size. The lesion was pink, surface was smooth without any secondary changes. The growth was firm, nontender, and no discharge was elicited [Figure 1]. The teeth in the region of the swelling were healthy pulpally and periodontally. Submandibular salivary gland was asymptomatic and normal salivary flow was elicited. Based on the history and clinical features, the lesion was provisionally diagnosed as a benign tumor of connective tissue origin. Differential diagnoses included fibroma, fibrolipoma, neurilemmoma, NF, angioleiomyoma, and minor salivary gland tumors. A mandibular cross-sectional occlusal radiograph did not show any abnormality. 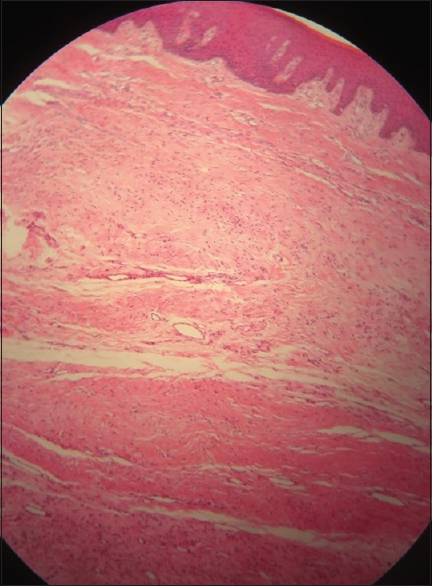 With patient's consent, the lesion was excised under local anesthesia and the specimen was submitted for histopathology. The hematoxylin and eosin stained sections showed an unencapsulated tumor mass composed of numerous, irregularly arranged spindle cells consisting of scanty cytoplasm and thin wavy nucleus along with fibroblasts, collagen bundles, few blood vessels, and nerve bundles. There was no evidence of malignancy in the cells. The histopathologic appearance was consistent with NF [Figure 2]. With a histopathologic diagnosis of NF, the patient was recalled and a thorough general examination was done to look for subtle NFs elsewhere on the body as well as for café-au-lait pigmentation. The examination ruled out the presence of either. Hence, a final diagnosis of SNF of the floor of the mouth was arrived at. A further confirmation was done using S 100 marker for immunohistochemistry and was found to show diffuse positivity in the spindle cells. The patient was reexamined 3 months after excision and no recurrence was noted. The overall reported prevalence of peripheral neural tumors is very low, which is about 0.2%. In one study, the prevalence of oral SNF was found to be 3.5% while in another study it was 6%. Hence, it ranges between 3% and 6%. They occur in a wide age range from 10 months to 70 years, and the mean age is 30 years., Among the gender, one study found a very high female preponderance of with male to female ratio being 9:1. Other reports have found equal gender distribution., Hence, there is lack of clarity regarding the gender distribution. SNs are commonly seen on the buccal mucosa followed by the hard and soft palate, gingiva, and the floor of the mouth., NFs occurring on the floor of the mouth are extremely rare. An analysis of 66 cases of SNFs of the oral cavity, only one occurred in the floor of the mouth while another study of 10 cases found none occurring in the floor of the mouth, making floor of the mouth a rare location for this rare tumor as in the present case. Oral NFs can be classified as those associated with neurofibromatosis Type 1 and 2 and those which are not. The World Health Organization classifies NFs into two types as dermal and plexiform types. Furthermore, many classifications based on the histopathological patterns are also available.,, Oral SNs present as sessile or pedunculated nodule which progresses slowly. Most often it is painless, but if painful, it is attributed to pressure effect on the originating nerve., SNFs may be noted in association with multiple endocrine neoplasia syndrome or neurofibromatosis. Etiology, till date, remains unknown. It is presumed that oral NFs arise from the branches of the trigeminal or facial nerve. Most often the origin of these lesions is difficult to trace. NFs associate with neurofibromatosis 1 has been investigated thoroughly and somatic mutation at the NF 1 gene, which is the tumor suppressor gene located on chromosome 17 has been found. Contrastingly, the pathogenesis of SNFs has rarely been investigated. Anecdotal studies have found NF 1 gene inactivation in SNFs as well. Under the light microscope, SFNs exhibit numerous spindle shaped cells with round or fusiform neuclei which are present in interlacing bundles. The cells have an eosinophilic cytoplasm, and the cells are distributed in a matrix of fine fibrillary collagen. They have a capsule and have a mix of perineural cells such as schwann cells and fibroblasts., Immunohistochemically, NFs are S 100 positive. NFs are treated by complete surgical excision, and they exhibit a low recurrence; hence, considered to have an excellent prognosis.,, Symptoms which indicate recurrence could be tingling sensation or paresthesia. SNFs are benign, peripheral neural tumors which are rare in the oral cavity, especially in the floor of the mouth. A thorough clinical examination to detect their association with syndromes needs to be evaluated. SNFs may appear clinically mimicking any other common benign lesion; hence, should not be disregarded and left alone but excised and histopathologically examined to rule out malignancy. Salla JT, Johann AC, Garcia BG, Aguiar MC, Mesquita RA. Retrospective analysis of oral peripheral nerve sheath tumors in Brazilians. Braz Oral Res 2009;23:43-8. Jain D, Chaudhary M, Patil S. Neurofibroma of the maxillary antrum: A rare case. Contemp Clin Dent 2014;5:115-8. Kodiya AM, Ngamdu YB, Sandabe MB, Isa A, Garandawa HI. Solitary isolated neurofibroma of the soft palate. J Surg Case Rep 2013;2013. pii: Rjs029. Depprich R, Singh DD, Reinecke P, Kübler NR, Handschel J. Solitary submucous neurofibroma of the mandible: Review of the literature and report of a rare case. Head Face Med 2009;5:24. Borges AH, Correia Rde M, Borba AM, Guedes OA, Estrela CR, Bandeca MC. Unusual solitary neurofibroma on the lower lip of a child. Contemp Clin Dent 2013;4:512-4. Maruyama M, Fushiki H, Watanabe Y. Solitary neurofibroma of the floor of the mouth: A case report. Case Rep Otolaryngol 2011;2011:967896. Suramya S, Shashikumar P, Sreeshyla HS, Kumar GS. Solitary plexiform neurofibroma of the gingiva: Unique presentation in the oral cavity. J Clin Diagn Res 2013;7:2090-2. Ohno J, Iwahashi T, Ozasa R, Okamura K, Taniguchi K. Solitary neurofibroma of the gingiva with prominent differentiation of Meissner bodies: A case report. Diagn Pathol 2010;5:61.